An article has been published about TXRF trace analysis in life science, by a group at Stockholm University. 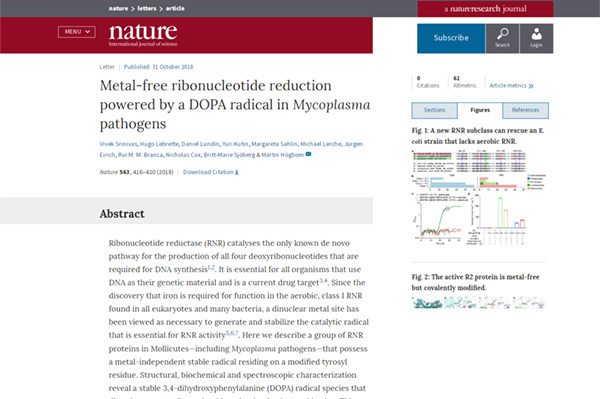 The scientific paper, entitled “Metal-free ribonucleotide reduction powered by a DOPA radical in Mycoplasma pathogens” is published in Nature and involves research using the Bruker S2 Picofox TXRF. Ribonucleotide reductase (RNR) is a catalyst for the only known de novo pathway in the production of all four essential deoxyribonucleotides for DNA synthesis. It is vital for all organisms with DNA as a genetic material. It’s also a current drug target. Iron is required for function in aerobic, class I RNR that are present in all eukaryotes and many bacteria. Since this discovery, dinuclear metal sites have been considered necessary for generating and stabilising catalytic radicals for RNR activity. The paper from Stockholm University discusses a group of RNR proteins in Mollicutes (including Mycoplasma pathogens) with a metal-independent stable radical, that resides on a modified tyrosyl residue. Using structural, biochemical and spectroscopic characterisation, they found a stable 3,4-dihydroxyphenylalanine (DOPA) radical species. This species directly supports ribonucleotide reduction in vitro and in vivo. This challenges the previous assumption that a dinuclear metal site is necessary for aerobic ribonucleotide reductase. The metal-independent radical requires new mechanisms to generate and stabilise radicals. These processes are targeted by RNR inhibitors. It’s possible that this RNR variant has advantages under metal starvation, induced by the immune system. Organisms encoding this type of RNR (including some that are becoming resistant to antibiotics) are related to disorders in the respiratory, urinary and genital tracts. Further analysis of this RNR group and its co-factor generation mechanisms will provide new information about enzymatic chemistry. This could be useful for developing strategies to combat the pathogens that use it. The group suggest that the RNR subclass should be known as class Ie. 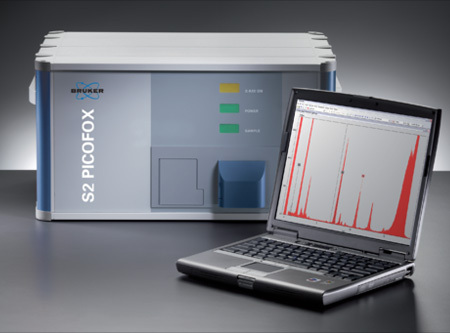 Established TXRF system with ppb and ppm range detection limits, suitable for all trace analysis applications, with all the benefits of the technique. 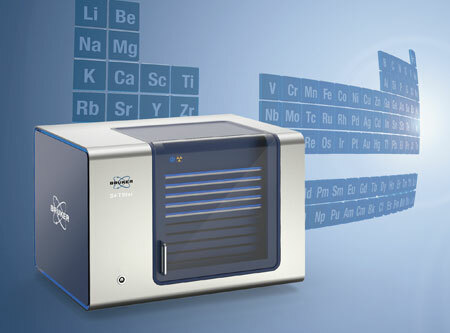 Newest and highest specification system for ultra trace analysis with low sub-ppb detection limits, automation and high sample capacity.